No story today. Just a bunch of crazy characters hanging out together. 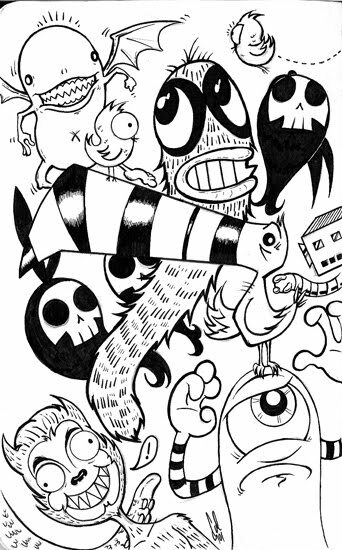 Some noticeable guys are Jimmy the Vampiric Lima Bean, the cyclopees, the coeheeghosts, Ampersand and Randy the retarded wolfboy. the McFeely Robot, Toto the handicapped Toucan and this weird harry worm guy that I have no name for. Any suggestions? I WILL post doodles on my blog as well - such a great idea I hope you don't mind me stealing it. Of course, my doodles aren't as cool as yours. Haha...I would never look at it as stealing. If anything, it's flattering that I've inspired a fellow artist to do something fun.